On the bottom of the calculator, there are five screws. Two are hidden under the single wide rubber foot at the bottom of the calculator. Once removed, there are plastic snaps along the edge of the case the rest of the way around the calculator body. There are two snaps across the top, three snaps on either side of the body, and one snap at the bottom. Beware! It is quite possible to make a mess of the faceplate while working the snaps. They're tight. The best way to remove the snaps is to use a small screwdriver and slide it between the faceplate and back just above the INPUT key. Torque it out to unsnap. Then you can continue unsnapping the two other snaps on that side with minimal mess. If using a screwdriver scares you, you can solely use your hands/fingers, although you will need to apply a fair amount of force to unsnap them. Next you need to unsnap the bottom. Here again, either hard manual force or use a screwdriver. Once you have the left side and bottom unsnapped, it is easy to wiggle the rest out. When you put it back together, be careful to orient the screen properly. The three snaps on the side are visible in this photo. One is by the screen, one is by CshFL, and one is by Shift. The other side mirrors this side. 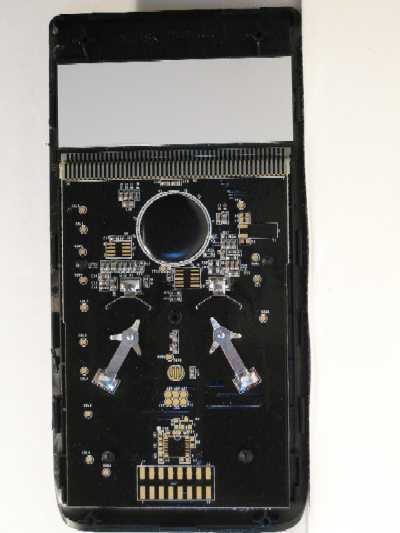 Once the case has been removed, the back of the circuit board is visible, revealing the JTAG connection points and the serial output connector.